The Indian market plays an important part for Sofarsolar global PV market layout，which Sofarsolar provides enough budget on the marketing, R & D, channels, services, and so on. Since 2015, Sofarsolar has completed its channel layout and built a perfect sales and service system in this market. The brand of Sofarsolar has been deeply rooted in the Indian market. To meet the market demand, Sofarsolar will launch several new inverters for the Indian market every year. Now，managing director of Indian market, Mr. Brijesh Prajapati explains that Sofarsolar launches the latest generation inverter model in the Indian market, named Sofar 1-3.3kW-G3，the new models include SOFAR1100TL-G3,SOFAR1600TL-G3,SOFAR2200TL-G3,SOFAR2700TL-G3,SOFAR3300TL-G3. Firstly, the G3 inverter of Sofarsolar has milky-white appearance, simple and generous design, which can help better integrating into the home environment and bring modern science and technology to owners. Besides, the G3 inverter of Sofarsolar fully customizes modular hardware system. The smart use of internal space, close arrangement of rules and reasonable optimization of internal space make the whole machine smaller in size and lighter in weight. For the installer, one-hand installation can be achieved. What is more, the G3 inverter of Sofarsolar has a unique core design and important components choose world famous brand which can keep the device design margin sufficiently and ensure long service life. Afterwards, the G3 inverter owns 97.7% max efficiency and has ultra high switching frequency design, wide input voltage range, DC support 1.4 times over，to improve machine performance and increase user revenue. As well as providing customers with higher quality inverter，the chassis of inverter is designed with all aluminum, and the input, output and communication interfaces are designed with lightning protection，the whole machine has IP65. 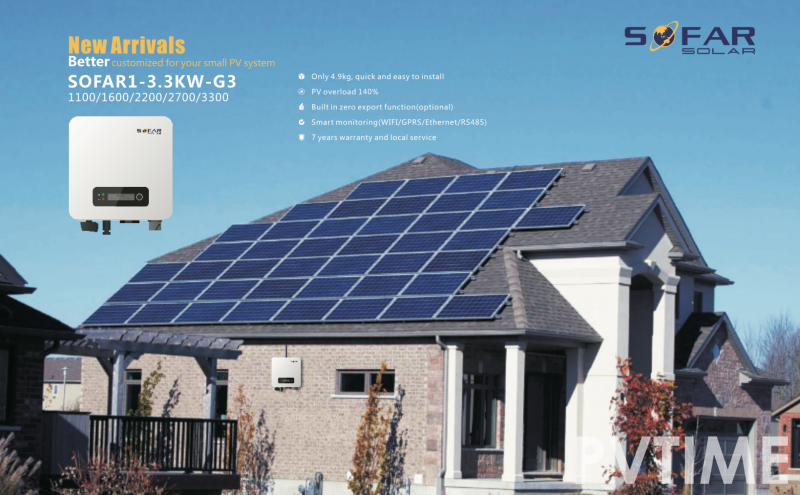 Finally, the G3 inverter with rich communication ports, such as WIFI/GPRS/Ethernet/RS485 can be selected flexibly to realize Intelligent control, which help user keeping track of the operation of the power station at any time by download the Solarman APP.